For comfort and hospitality in the heart of Heraklion, the Olympic Hotel is open all year round and provides services and conveniences that meet the demands of today's leisure and business traveller alike. 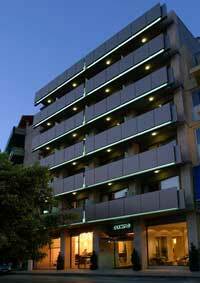 Within easy access and short distance from all the sights and the favourable position on Kornarou Square, the Olympic Hotel Olympic is the ideal choice for the visitor who wants to spend a few days in a luxurious environment in the city of Heraklion. The Olympic Hotel has 73 spacious and comfortable rooms, with double glazing for optimal sound isolation, central heating and separate air-condition, as well as an integrated system of fire-protection and fire-extinction that covers the hotel throughout. Furnished with hand-made oak furniture and decorated with particular tastefulness rooms, the Olympic Hotel offers all modern conveniences and services. The experienced and friendly staff will satisfy the needs and wishes of our guests who are in town either on business or to enjoy their holidays. The Olympic Hotel offers single, double and triple rooms (with a sofa bed) as well as rooms for guests with disabilities. Furthermore, connected rooms are available, specially designed for families. There are rooms with a balcony or a veranda. Security lock with card and energy saving system. Hand-made oak furniture and fixed oak wardrobes. Wall to wall carpet in all rooms. Direct telephone with personal answering machine & DDI. Baby cot (without charge on previous arrangement). The common areas of the Olympic Hotel are fully air-conditioned and consist of a restaurant with traditional Greek cuisine and a rich breakfast buffet, a sitting room with TV and a large lounge with a fireplace for relaxation over a cup of coffee and cake or for a friendly talk with friends or business associates. The Olympic Hotel also has a roof garden that offers a panoramic view. The special Cafe - Bar of the hotel, one of the most popular rendezvous of the town, serves coffee, drinks, light meals, cakes and ice-cream and is open from early in the morning until late at night. Room service (08.00 – 23.00). Daily cleaning services: laundry, dry cleaning, ironing. Parking around the hotel and 2 parking stations within 100 m.
Accessibility for people with disabilities to all hotel areas. Doctor (24-hours, upon telephone communication). The excellent location of the Olympic Hotel in the centre of the city of Heraklion renders it an ideal place to stay.